Precision medicine is tailored to individuals based on quantitative signatures, including genomics, lifestyle, and environment. It is often considered to be the driving force behind the next wave of human health. Through new initiatives and technologies such as population-scale genomics sequencing and IoT-backed wearables, researchers and clinicians in both commercial and public sectors are gaining new, previously inaccessible insights. PrecisionFDA – This initiative is led by the US Food and Drug Administration. The goal is to define the next-generation standard of care for genomics in precision medicine. American Heart Association Precision Medicine Platform – The platform gives researchers the ability to collaborate and analyze datasets, to better predict and intervene in cardiovascular disease and stroke. Deloitte ConvergeHEALTH – Gives healthcare and life sciences organizations the ability to analyze their disparate datasets on a singular real world evidence platform. Central to many of these initiatives is genomics, which gives healthcare organizations the ability to establish a baseline for longitudinal studies. Due to its wide applicability in precision medicine initiatives—from rare disease diagnosis to improving outcomes of clinical trials—genomics data is growing at a larger rate than Moore’s law across the globe. Many expect these datasets to grow to be in the range of tens of exabytes by 2025. Genomics data is also regularly re-analyzed by the community as researchers develop new computational methods or compare older data with newer genome references. These trends are driving innovations in data analysis methods and algorithms to address the massive increase of computational requirements. Edico Genome, an AWS Partner Network (APN) Partner, has developed a novel solution that accelerates genomics analysis using field-programmable gate arrays, or FPGAs. Historically, Edico Genome deployed their FPGA appliances on-premises. When AWS announced the Amazon EC2 F1 FPGA-based instance family in December 2016, Edico Genome adopted a cloud-first strategy, became a F1 launch partner, and was one of the first partners to deploy FPGA-enabled applications on AWS. On October 19, 2017, Edico Genome partnered with the Children’s Hospital of Philadelphia (CHOP) to demonstrate their FPGA-accelerated genomic pipeline software, called DRAGEN. It can significantly reduce time-to-insight for patient genomes, and analyzed 1,000 genomes from the Center for Applied Genomics Biobank in the shortest time possible. This set a Guinness World Record for the fastest analysis of 1000 whole human genomes, and they did this using 1000 EC2 f1.2xlarge instances in a single AWS region. Not only were they able to analyze genomes at high throughput, they did so averaging approximately $3 per whole human genome of AWS compute for the analysis. 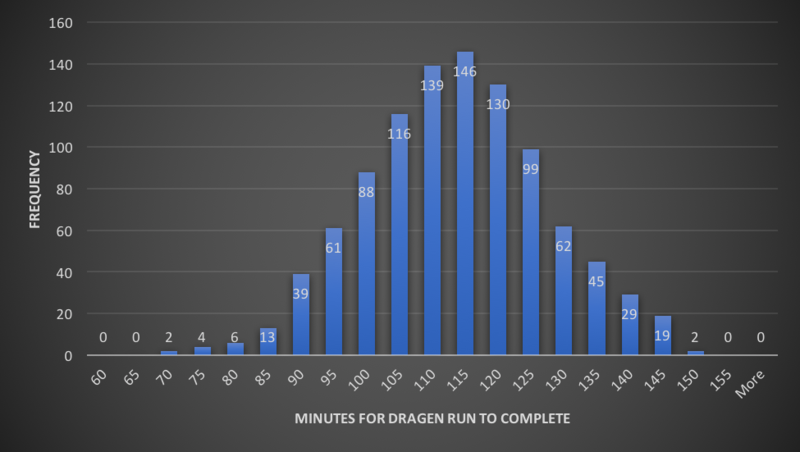 The version of DRAGEN that Edico Genome used for this analysis was also the same one used in the precisionFDA Hidden Treasures – Warm Up challenge, where they were one of the top performers in every assessment. In the remainder of this post, we walk through the architecture used by Edico Genome, combining EC2 F1 instances and AWS Batch to achieve this milestone. EC2 F1 instances provide access to programmable hardware-acceleration using FPGAs at a cloud scale. AWS customers use F1 instances for a wide variety of applications, including big data, financial analytics and risk analysis, image and video processing, engineering simulations, AR/VR, and accelerated genomics. Edico Genome’s FPGA-backed DRAGEN Bio-IT Platform is now integrated with EC2 F1 instances. You can access the accuracy, speed, flexibility, and low compute cost of DRAGEN through a number of third-party platforms, AWS Marketplace, and Edico Genome’s own platform. The DRAGEN platform offers a scalable, accelerated, and cost-efficient secondary analysis solution for a wide variety of genomics applications. Edico Genome also provides a highly optimized mechanism for the efficient storage of genomic data. Edico Genome used 1,000 EC2 F1 instances to help their customer, the Children’s Hospital of Philadelphia (CHOP), to process and analyze all 1,000 whole human genomes in parallel. They used AWS Batch to provision compute resources and orchestrate DRAGEN compute jobs across the 1,000 EC2 F1 instances. This solution successfully addressed the challenge of creating a scalable genomic processing pipeline that can easily scale to thousands of engines running in parallel. DRAGEN’s portal uses Elastic Load Balancing and Auto Scaling groups to scale out EC2 instances that submitted jobs to AWS Batch. Job metadata is stored in their Workflow Management (WFM) database, built on top of Amazon Aurora. The DRAGEN Workflow Manager API submits jobs to AWS Batch. These jobs are executed on the AWS Batch managed compute environment that was responsible for launching the EC2 F1 instances. These jobs run as Docker containers that have the requisite DRAGEN binaries for whole genome analysis. As each job runs, it retrieves and stores genomics data that is staged in Amazon S3. Workflow: Edico Genome used their Workflow Management API to orchestrate the submission of AWS Batch jobs. Metadata for the jobs (such as the S3 locations of the genomes, etc.) resides in the Workflow Management Database backed by Amazon Aurora. Batch execution: AWS Batch launches EC2 F1 instances and coordinates the execution of DRAGEN jobs on these compute resources. 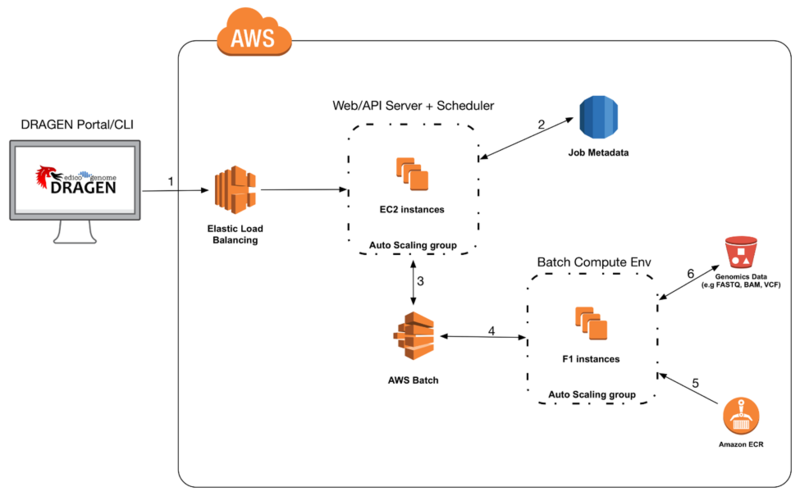 AWS Batch enabled Edico to quickly and easily scale up to the full number of instances they needed as jobs were submitted. They also scaled back down as each job was completed, to optimize for both cost and performance. Compute/job: Edico Genome stored their binaries in a Docker container that AWS Batch deployed onto each of the F1 instances, giving each instance the ability to run DRAGEN without the need to pre-install the core executables. The AWS based DRAGEN solution streams all genomics data from S3 for local computation and then writes the results to a destination bucket. They used an AWS Batch job role that specified the IAM permissions. The role ensured that DRAGEN only had access to the buckets or S3 key space it needed for the analysis. Jobs didn’t need to embed AWS credentials. We also covered these concepts previously in the Building High-Throughput Genomics Batch Workflows on AWS series on the AWS Compute blog. In brief, you need a modern Linux distribution (3.10+), Amazon ECS Container Agent, awslogs driver, and Docker configured on your image. There are additional recommendations in the Compute Resource AMI specification. You can use any Amazon Machine Image (AMI) or Amazon FPGA Image (AFI) with AWS Batch, provided that it meets the Compute Resource AMI specification. This gives you the ability to customize any workload by increasing the size of root or data volumes, adding instance stores, and connecting with the FPGA (F) and GPU (G and P) instance families. Add any additional software required to interact with the FPGAs on the F1 instances. As a starting point, AWS publishes an FPGA Developer AMI in the AWS Marketplace. It is based on a CentOS Linux image and includes pre-integrated FPGA development tools. It also includes the runtime tools required to develop and use custom FPGAs for hardware acceleration applications. For more information about how to set up custom AMIs for your AWS Batch managed compute environments, see Creating a Compute Resource AMI. There are two common methods for connecting to AWS Batch to run FPGA-enabled algorithms. The first method, which is the route Edico Genome took, involves storing your binaries in the Docker container itself and running that on top of an F1 instance with Docker installed. The following code example is what a Dockerfile to build your container might look like for this scenario. RUN yum groupinstall -y "Development Tools"
Note: Edico Genome’s custom Python wrapper functions for its Workflow Management System (WFMS) in the latter part of this Dockerfile should be replaced with functions that are specific to your workflow. The second method is to install binaries and then use Docker as a lightweight connector between AWS Batch and the AFI. For example, this might be a route you would choose to use if you were provisioning DRAGEN from the AWS Marketplace. In this case, the Dockerfile would not contain the installation of the binaries to run DRAGEN, but would contain any other packages necessary for job completion. When you run your Docker container, you enable Docker to access the underlying file system. AWS Batch provisions compute resources and runs your jobs, choosing the right instance types based on your job requirements and scaling down resources as work is completed. AWS Batch users submit a job, based on a template or “job definition” to an AWS Batch job queue. Job queues are mapped to one or more compute environments that describe the quantity and types of resources that AWS Batch can provision. In this case, Edico created a managed compute environment that was able to launch 1,000 EC2 F1 instances across multiple Availability Zones in us-east-1. As jobs are submitted to a job queue, the service launches the required quantity and types of instances that are needed. As instances become available, AWS Batch then runs each job within appropriately sized Docker containers. The Edico Genome workflow manager API submits jobs to an AWS Batch job queue. This job queue maps to an AWS Batch managed compute environment containing On-Demand F1 instances. In this section, you can set this up yourself. "Name": "Batch Instance – F1OnDemand"
The logs for your job are written to the /aws/batch/job CloudWatch log group. In this post, we demonstrated how to set up an environment with AWS Batch that can run DRAGEN on EC2 F1 instances at scale. If you followed the walkthrough, you’ve replicated much of the architecture Edico Genome used to set the Guinness World Record. There are several ways in which you can harness the computational power of DRAGEN to analyze genomes at scale. First, DRAGEN is available through several different genomics platforms, such as the DNAnexus Platform. DRAGEN is also available on the AWS Marketplace. You can apply the architecture presented in this post to build a scalable solution that is both performant and cost-optimized. For more information about how AWS Batch can facilitate genomics processing at scale, be sure to check out our aws-batch-genomics GitHub repo on high-throughput genomics on AWS.